Fantasy Book Critic: Winners of the Charlie Huston/Joe Pitt, David Gemmell/Troy and “Dragon Harper” giveaways!!! Winners of the Charlie Huston/Joe Pitt, David Gemmell/Troy and “Dragon Harper” giveaways!!! Congratulations to Elizabeth Browe (Michigan), Jennifer Juday (Texas) and Bruce Houck (Minnesota) who were all randomly selected to win a SET of Charlie Huston’s Joe Pitt novels including copies of “Already Dead”, “No Dominion” and the new book “Half the Blood of Brooklyn” (Reviewed HERE), all thanks to Ballantine Books!!! Congratulations also to Patricia Winiecki (California) who was randomly selected to win a SET of David Gemmell's Troy trilogy including copies of "Lord of the Silver Bow", "Shield of Thunder" and the new book "Fall of Kings", thanks again to Ballantine Books!!! 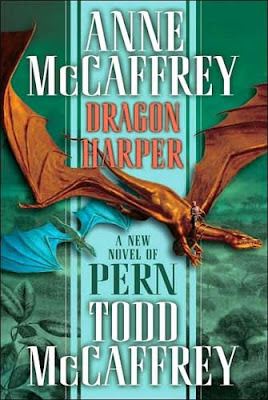 Finally, congratulations to Debbie Hill (New Jersey), Allen White (Louisiana), and Kathleen Fleitz (New Mexico) who were all randomly selected to win a COPY of “Dragon Harper” by Anne McCaffrey + Todd McCaffrey thanks to Del Rey!!! As you can see, I’m back!!! Vacation was wonderful—though not nearly long enough—and we all contracted a head cold which we’re still suffering from, and of course I’m terribly backed up with everything right now, but it was definitely worth it :) Regarding Fantasy Book Critic, the next batch of giveaways have started HERE for Carrie Vaughn’s “Kitty and the Silver Bullet” and don’t forget that the giveaways for a set of Robin Hobb’s Soldier Son trilogy (Enter HERE) and Mike Resnic’s Starship novels (Enter HERE) are still running. Speaking of Ms. Hobb, I should be posting my interview with the author next week, and if you’re lucky I’ll get that special article up, which I’ve been hinting at ;) Other than that, expect plenty of book reviews, interviews and whatnot as I ease back into the grind... Happy New Year!! !